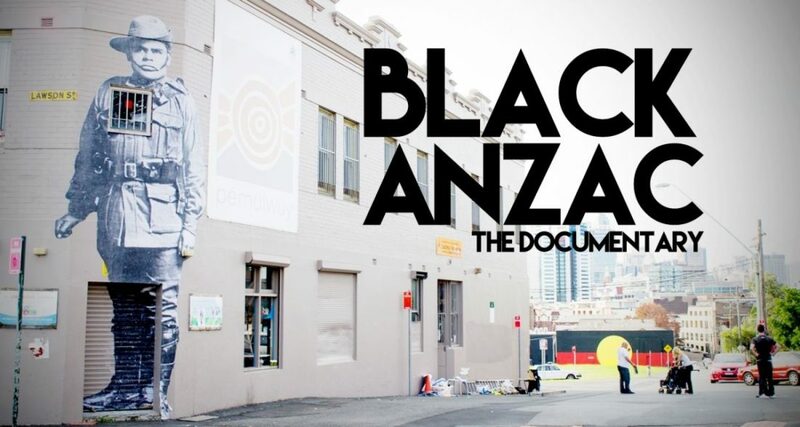 “Black ANZAC” is the first feature documentary by Sydney-based director Tim Anastasi. The film depicts the journey of Australian visual artist Hego as he attempts to commemorate the memory of Aboriginal soldiers who fought in WW1 through a mural project in the inner-city Sydney suburb of Redfern and elsewhere in Australia such as Meningie. The film is slated to screen July 13th at the Melbourne Documentary Film Festival. Categorized by the festival as an art documentary, “Black ANZAC” is far from being your typical art film. While many art docs have a tendency to be self-indulgent and either focus on the artist’s biography or artistic creation alone, “Black ANZAC” is a film in which art is the vehicle by which history is told both on-screen and off. In fact, it’s fair to say the main subject of the film isn’t Hego at all but Alfred Cameron Jnr and the other Indigenous soldiers who fought abroad and whose memory Hego’s work seeks to keep alive. While by no means purely an ‘art doc,’ if you are into art, you will certainly enjoy seeing the brief technical scenes on wheat paste (who knew an adhesive could be so frustrating!) as well as the general construction and evolution of Hego’s project. However, say you can’t tell crayons from chalk or you’re more interested in history than murals, then this is still 100% the film for you. Actually, it’s a film for anyone with Australia in their heart and a desire to learn more about the involvement of Indigenous Australians in the country’s overseas conflicts. What makes this film such an engaging watch is that even though Hego is the film’s primary voice or storyteller, he is also learning about the history of the Indigenous soldiers along with the viewer, so it feels like the audience is on the journey with him. Without giving too much away, there are some truly special scenes with Alfred Cameron Jnr’s family that lend an intimacy to the film and create a sense of history that feels closer to home than perhaps one might get from just reading about the Aboriginal soldiers in a book. For his first feature length documentary, Anastasi triumphs with “Black ANZAC” at showing the collision of history and art and how together they can be used to create a dialogue to enhance understanding and promote a greater sense of awareness and appreciation, especially for this group of soldiers who served selflessly, and who thanks to Hego, have no doubt sparked curiosity in the minds of many to find out more about the men depicted in his murals. “Black ANZAC” screens July 13th at the Melbourne Documentary Film Festival. For more information on the film, visit: blackanzacdocumentary.com and follow the film on Facebook. To learn more about Hego’s art, check out: hegoart.com. Additional festival information online at: mdff.org.au.